Twitter and the iPhone have always seemed made for each other—quick messages you can tap out on your phone’s keyboard while you’re on the go. But will the iPad show a similar affinity for the social networking service? If the App Store is any indication, app developers think so: the store is already awash with Twitter clients for the new device. Here are three popular apps for the site that have made the jump from iPhone to iPad. 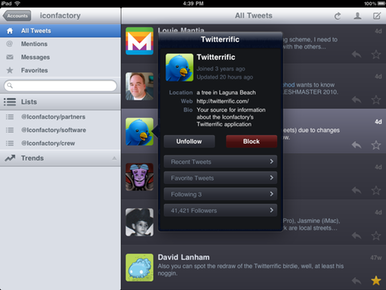 One of the iPhone’s best Twitter clients (and one of the first Mac clients), the Iconfactory’s Twitterrific for the iPad super-sizes its Ollie the bluebird mascot for Apple’s newest device. At first glance, Twitterrific for iPad looks a lot like the iPhone version, down to the same understated color scheme, but don’t be mistaken: it’s an entirely new app, written from scratch for the iPad. Like the iPhone version, you can read and compose tweets; filter for mentions, direct messages, and favorites; and even translate tweets in foreign languages into your native tongue. The iPad improvements are mainly focused on the program’s interface: there’s now a split view when the device is in landscape mode, allowing you to choose which type of message is listed in the main display. And tapping on any user’s avatar summons a popover with their profile and a number of possible actions. Twitterrific is available in the App Store now. The basic version is ad-supported, and you can update to Twitterrific Premium (which disables ads) for $5 via in-app purchase. Both versions require an iPad running iPhone OS 3.2 or later. 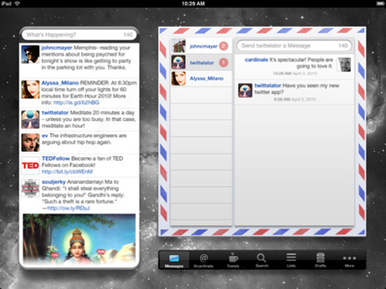 Elsewhere, Stone Design has released Twittelator Pad, an iPad version of its popular iPhone client. The app has been redesigned to take advantage of the iPad’s form factor, with a split view that lets you skim timelines and simultaneously view direct messages, mentions, trends, and more. You can even create drafts in an interface reminscent of the iPhone’s Notes app. In addition, you can actually set a wallpaper background to float behind your Twitter stream, adding a nice hint of personalization to the app. And, of course, Twittelator Pad has all of the features you’ve come to expect from its iPhone version, including support for multiple accounts, inline images, viewing tweets from people nearby, and more. Twittelator Pad costs $5 and is available in the App Store now. It requires an iPad running iPhone OS 3.2 or later. If it’s sheer columns of data that you require in your Twitter client, TweetDeck for iPad is made just for you. Best of all, the iPad’s increased screen real estate means more columns, and TweetDeck doesn’t disappoint. You can add columns for specific lists of Twitter users you follow, mentions, and direct messages, as well as for Trending Topics and search terms you define. And TweetDeck allows you to rearrange those columns exactly to your liking, including deleting those you don’t want. On the composition side, you can cross post updates to any or all of your accounts, geotag your tweets, and upload pictures from the iPad’s photo library. And TweetDeck for iPad syncs with both TweetDeck on your desktop and on the iPhone, so you can read your tweets no matter which of your many devices you’re on. Plus, TweetDeck says even more improvements are coming in version 2.0, including full Facebook integration, notifications, and real-time visualizations. 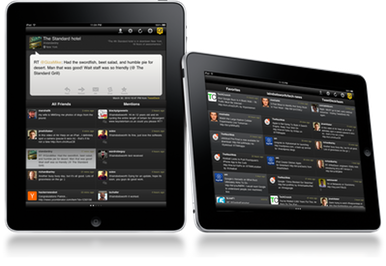 TweetDeck for iPad costs $5 and is available on the App Store now. It requires an iPad running iPad OS 3.2 or later. Widely regarded as one of the best—if not the best—Twitter client around, Atebits’s Tweetie (available for iPhone and Mac) is set apart from the above apps by one distinct factor: there isn’t an iPad version yet. Search high and low as you may, the only thing you’ll find in the App Store is Tweetie 2 for the iPhone. Where is it? Is it coming? Nobody outside of Atebits's secret compound knows for sure, so for now you’ll have to content yourself with running the iPhone version or trying out one of the many competitors, including those already listed.